Marian Sampson scarlet monardella is a ground-hugging California native that grows 3-4" tall and 6-8" wide. It has clusters of dazzling red tubular flowers that bloom in late spring through early summer. A dazzling selection of the California native wildflower species, Monardella macrantha 'Marian Sampson' has clusters of brilliant red, tubular flowers held over low mats of dark green, shiny leaves. Blooming in late spring it is certain to attract the hummingbirds. 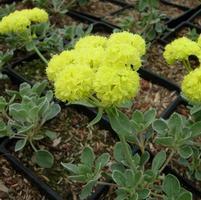 This little gem is great for a rock garden or in a container. Easy-to-grow, it needs sharp drainage and infrequent summer water. It's short-lived, but makes up for it by being exceptionally showy and exotic. Introduced into the trade by Ed Sampson of the Mourning Cloak Ranch and Botanical Gardens in Tehachapi, CA and named in honor of his late wife, Marian.